Designed for chaplains and others who serve Muslim patients in health care, this webinar will explore the dynamics of Islamic traditions and requirements. Many issues will be covered, including gender sensitivities and restrictions, dietary requirements, coping with illness, power of attorney, writing a will, end-of-life decisions, funeral arrangements, condolence visitations, and burial requirements and traditions. 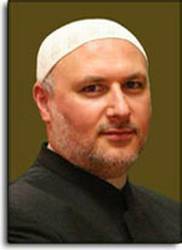 Sheikh Kifah Mustapha is an Imam and the associate director of the Mosque Foundation in Bridgeview, IL. He also is a teacher of Islamic Studies at Universal High in Bridgeview. Sh. Mustapha serves Chairman of the Illinois Council of Imams and Scholars, as president for the Shura of Islamic Family Counselors of America. In addition, he is a member of the National Spiritual Care Task Force & Critical Response Team for Red Cross and serves on the advisory board of Mission and Spiritual Care for Advocate Health Group in Illinois. An active participant in interfaith relations and experienced public speaker, Sh. Mustapha is a recipient of the Lincoln Land Legends' Scholars for Dollars Award and a graduate of the FBI Citizens' Academy program.